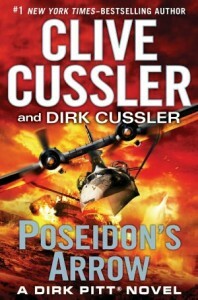 Clive and Dirk Cussler will sign POSEIDON’S ARROW, a new Dirk Pitt® adventure, at the Arizona Biltmore in Phoenix on November 13, 2012 from 7:00 p.m. – 9:00 p.m. at an event organized by The Poisoned Pen bookstore. Clive and Dirk will not be touring other cities; this is the only public event scheduled for Poseidon’s Arrow. This event is free and open to the public. However all copies of POSEIDON’S ARROW to be autographed must be purchased at the event or ordered in advance from The Poisoned Pen. More information about the event can be found at the Poisoned Pen website.